Statistics and numbers often dominate the implementation of greenery and sustainable initiatives in the built environment. But what about the human experience? 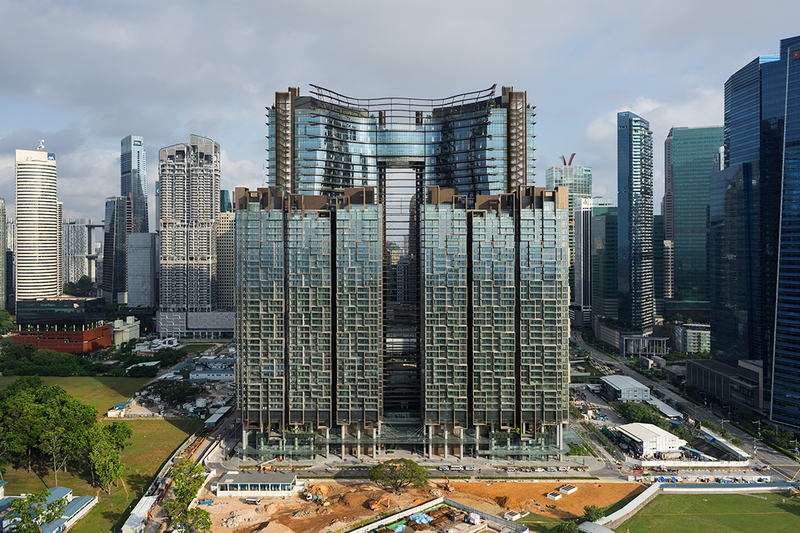 The latter was front of mind during the design and construction of Marina One Singapore by Ingenhoven Architects in collaboration with Architects 61. 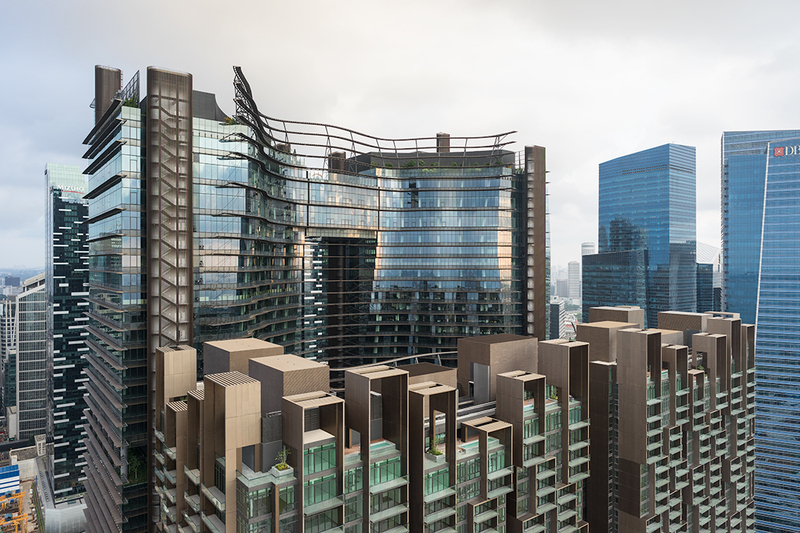 In many ways, Singapore often proves itself a valid test bed for new urban and architectural models – exploration being demanded by density, supported by regulation, and given fascinating complexity by climate. 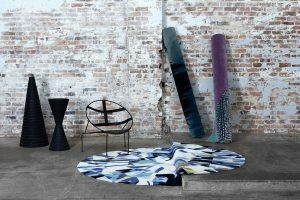 Marina One presents the confluence of several agendas expressed in a way that makes each one indivisible from the others. Sustainable design directions for high-rise in the tropics, the incorporation of greenery in line with the national ‘garden’ story, and the carving out of high-quality publicly accessible space from a commercial site – the project is notable for all these things, in addition to the achievement of an impressive level of finish in a construction context known better for its default to the quickest solutions. The mixed-use development sits on land vested to Malaysia as part of the KTM railway land swap. The developer, M+S, is owned 60:40 by Malaysia’s strategic investment fund Khazanah Nasional and Singapore’s investment company Temasek. The symbolism of mutual interest can be read in the form of the massing of Marina One – a cluster of four towers (two for offices facing neighbouring Asia Square, and two for residences facing the sea, with retail and transport connections at the base) that create straight vertical facades to the exterior but are carved and undulating in unison around an inner landscaped zone described as the ‘Green Heart’. The heart is the centrepiece of the design by Ingenhoven Architects, who worked with architect A61 and landscape architects Gustafson Porter + Bowman, in collaboration with ICN Design International, to bring the project to fruition. 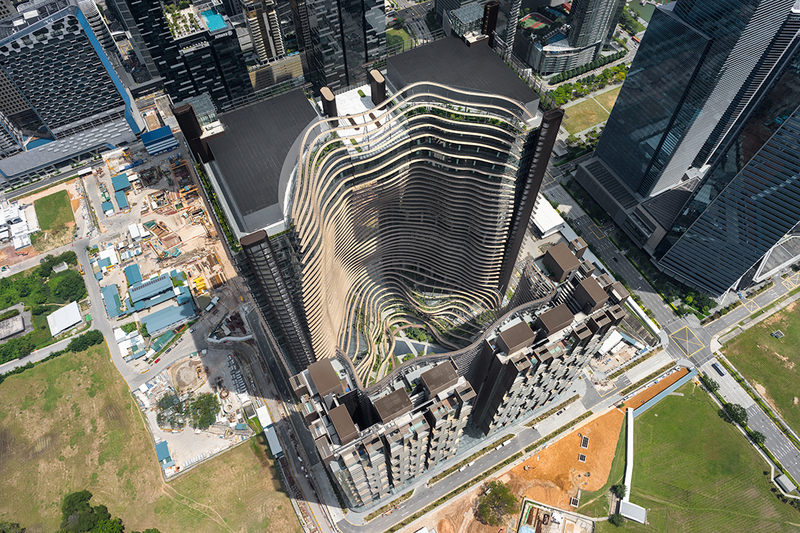 “We won the competition because we did something very different: four towers pushed towards the outer site boundary, creating an open public space in the centre of the development,” says Olaf Kluge, the Singapore Director of Ingenhoven Architects. “Normally buildings are arranged in some kind of a star formation, so they open up to the outside and you increase the views. 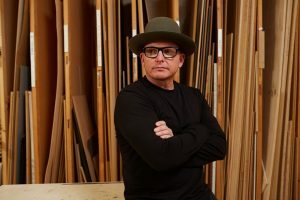 But here we created a space inside, which we could control, which has high quality as a public space and will become the focal point of the CBD extension in the future,” he says. 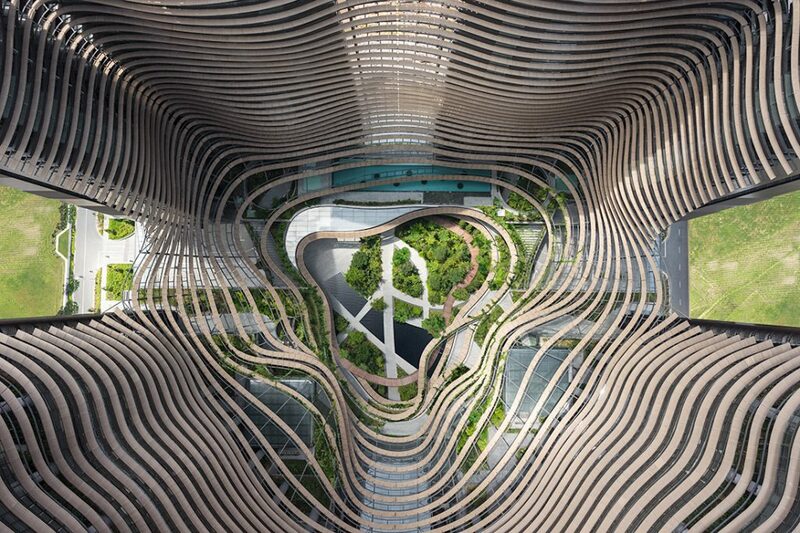 The Green Heart contains vegetation at multiple levels and sets in place a sweeping, overlapping rounded geometry that extends up the facades of the towers and generates a mass that leans inwards as it rises (supported internally by kinked columns). 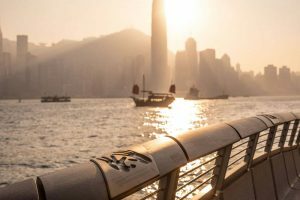 The self-shading effect is maximised by the presence of 35 kilometres of horizontal sunshading screens. “In Singapore the sun rises very fast due to our location near the equator. With horizontal shading devices, the facade performs more effectively with a 33 per cent reduction in energy consumption from baseline code-compliance requirements and better glare control, while maintaining full views out,” says Kluge. Midday sun reaches the Green Heart with intense light for three to five hours a day, which, says Kluge, is enough for the plants to grow based on previous studies by Gustafson Porter + Bowman. The building mass is punctured by pedestrian routes through the site in two directions, and the apartment towers are pierced by airwells and slots that bring natural ventilation to units and corridors. The Green Heart enhances natural air convection. This, in concert with the presence of greenery and water, makes for an air temperature reduction of approximately 1.5 degrees Celsius, according to Ingenhoven Architects. “We’ve done everything possible in the podium levels to achieve optimum temperature and comfort,” says Kluge. The project literature presents many impressive statistics: 717 trees, 42 tree species, 271 species of shrubs and palms, a green area of 37,000 square metres and 125 per cent landscape replacement area. Equally impressive are the sustainability initiatives: rainwater is collected from the multiple roofs, terraces and facades, and used for irrigation; waste heat from air-conditioning units is channelled back into the building system and helps to heat up the water supply; energy-efficient light fittings (T5 flourescents and LEDs) have been installed in the office towers; the sunshades cut glare in the office spaces, allowing for the use of clearer glass and thus less artificial lighting; low VOC materials were used for all internal walls; car parks feature assisted natural ventilation (jet fans) and are fitted with carbon monoxide sensors; recycled materials and certified ‘green’ cement were used in the construction. But what of the experience of the spaces? 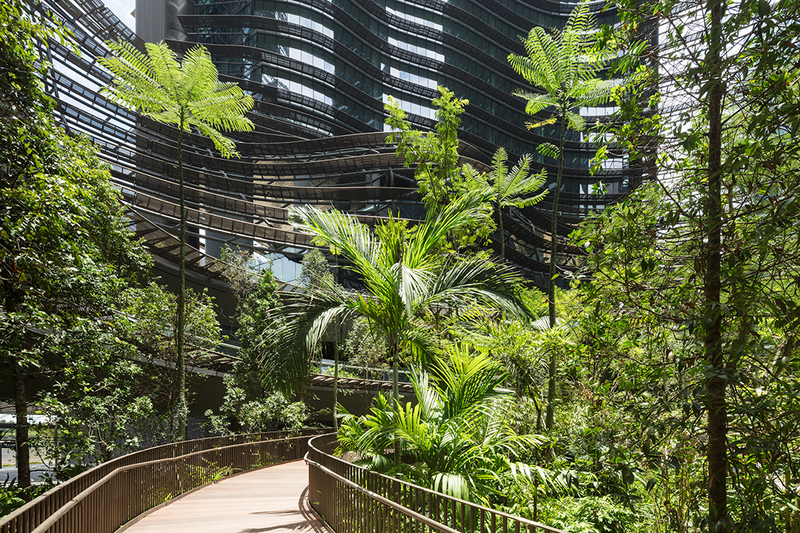 The multi-level Green Heart allows for a repeated connection with greenery, and a ramped pathway from ground level to level three allows a meandering experience through tree canopies – a rarity within an urban environment. The experience of the Green Heart is one of richly layered spaces and diagonal visual connections, and at times the supporting structure for the sunshading takes on the character of vines. 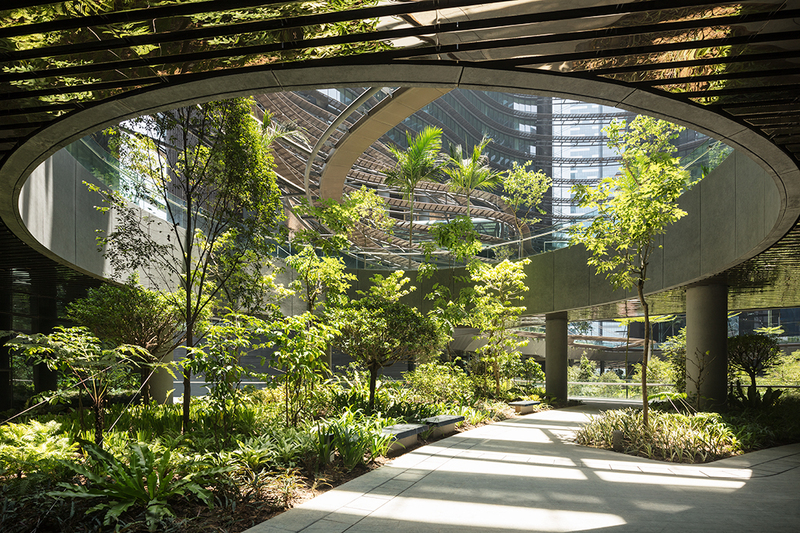 Ceilings in key areas have been finished with embossed stainless steel, which brings reflections of the greenery into the building and reinforces the calming green aspect. Observation lifts offer the delight of a dynamic, light-filled visual experience. 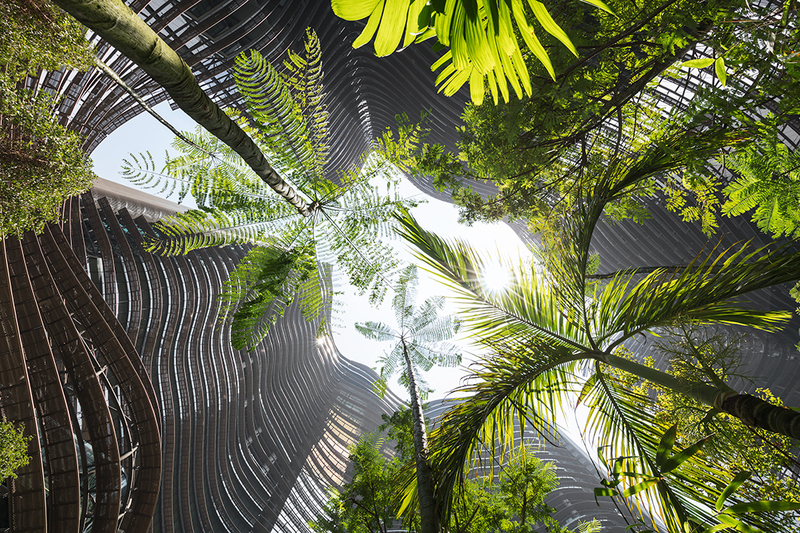 We can expect an ongoing increase in the presence of greenery within Singapore’s built environment, and ongoing emphasis on sustainable initiatives. But a key to the success of green spaces will be their usability. Marina One offers high-quality publicly accessible space in addition to a delightful breakout zone for office workers and a backyard for residents. The Green Heart encourages a progressive experience – a walking encounter rather than a static green view. Importantly, there is ample opportunity to sit within the green under shade. 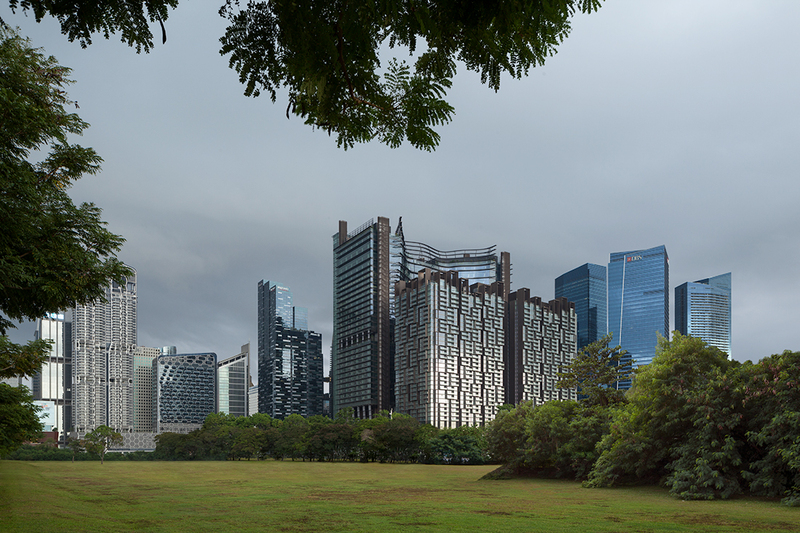 It’s a forest-like encounter that one hopes we’ll see more of as the bare reclaimed land of Marina Bay is built up. 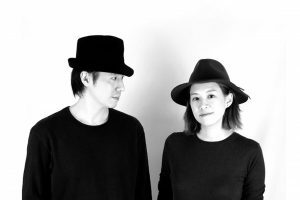 This article was first published in Cubes magazine, issue 92 (July 2018). We’re calling for outstanding buildings for the 2019 INDE.Awards, but entries close soon! The Building category is proudly supported by CULT. 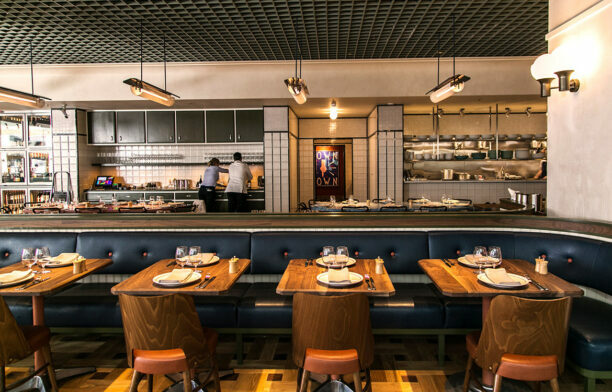 Photography by HG Esch (courtesy of Ingenhoven Architects), unless otherwise stated.